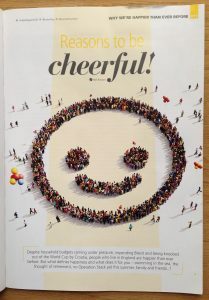 Wellbeing and happiness are real buzzwords at the moment, but what does it really mean to be happy? 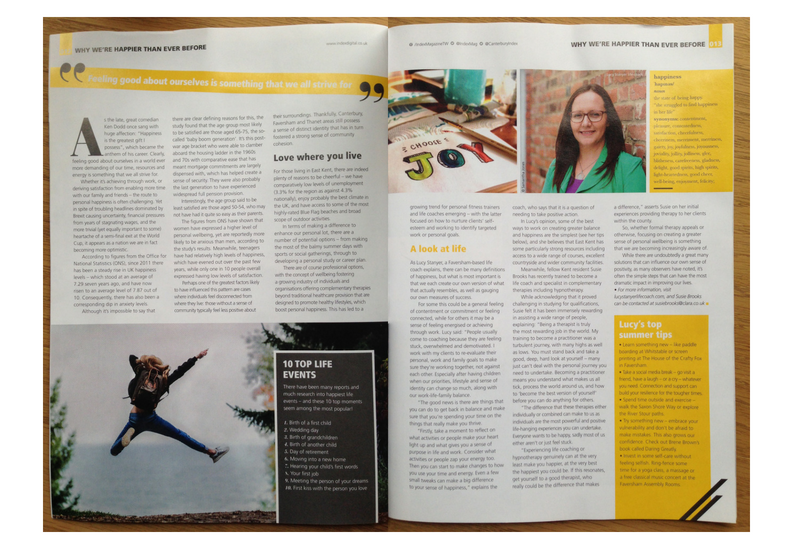 I am featured in Canterbury Index magazine this month talking about how we can take time to increase our sense of wellbeing this summer, with some top tips on how to do this. You can read the full article in Canterbury Index online. There are many definitions of happiness, but for me what’s most important is that we each create our own definition of happiness and our own measures of success. For some, this will be a feeling of contentment or being connected. Whereas for others it will be feeling energised or a sense of success in work. People usually come to coaching because they are feeling stuck, overwhelmed and demotivated. I work with my clients to re-evaluate their personal, work and family goals to make sure they’re working together, not against each other. Especially after having children, when our priorities, lifestyle and sense of identity can change so much, along with our work-life-family balance! The good news is there are things that you can do to get back in balance and make sure that you’re spending your time on the things that really make you thrive. Firstly, take a moment to reflect on what activities or people make your heart light up and what gives you a sense of purpose in life and work. Consider what activities or people zap your energy too. Then you can start to make changes to how you use your time and energy. Even a few small tweaks can make a big difference to your sense of happiness. Learn something new – like paddle boarding at Whitstable or screen printing at The House of the Crafty Fox in Faversham. Take a social media break – go visit a friend, have a laugh, or a cry. Whatever you need. Connection and support can build your resilience for the tougher times. Spend time outside and exercise – walk the Saxon Shore Way or explore the River Stour paths. Try something new – embrace your vulnerability and don’t be afraid to make mistakes. This also grows our confidence. Check out Brene Brown’s book called Daring Greatly or watch her TED Talk. Invest in some self care without feeling selfish. Ring-fence some time for a yoga class, a massage or a free classical music concert at the Faversham Assembly Rooms. My final tip for the simplest and most effective way to boost your happiness is to practise gratitude with a daily gratitude journal. How do you use the summer to feed your soul and improve your sense of wellbeing? What new things have you learnt lately? And how to you get your me time? Feel free to add your ideas in the comments below. Contact me for your free discovery session to find out if coaching can help you get the clarity you need and boost your business development, make significant changes to your career or improve your work-life balance. There’s no obligation and no charge for this 45 minute discovery call. If you like my approach, then we can book your first session and start your journey to making change with confidence.